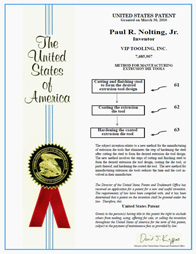 VIP Tooling’s commitment to continual innovation has led us to become a global leader in the aluminum extrusion tooling industry. Our patented process of producing extrusion tooling highlights this innovation. Improving die life and performance has always been a concern to extruders. Improved die life leads to extended time in the press and increased recovery rates. Historically, H-13 has been the steel of choice for extrusion dies and support tooling. Through developments in steel chemistries, processing procedures and designs, it is possible to use steels more suited for the different areas of the die. Rather than use a one size fits all approach we can use materials that are more suited to the different requirements of the typical extrusion die. Our patented coated inserts have a steel substrate with a CVD coating. The use of the steel substrate eliminates the need for a high compression fit between the insert holder and insert, thus causing less insert fracture and failure. The processes that have been developed over the past 15 years using this technology have led to great success.